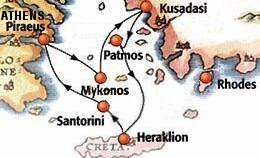 3-day Cruise "Iconic Aegean - 4 Greek Islands & Turkey"
1 night hotel in Athens, and 1 transfer (hotel to port). and start from US$489 per person! Have a look below! Port & Service Charges: US$159 per person (to be added to the above) independently of cabin occupancy. * Children under 11 years-old cruise Free of Charge when sharing a cabin with 2 paying passengers. This is an ALL INCLUCIVE cruise! The above prices INCLUDE the All-Inclusive DRINKS PACKAGE (including alcoholic and non-alcoholic beverages), and also 2 shore excursions (as described above). A 3rd or 4th adult (or child of 12 years-old or more) in the cabin/room, is charged the special rates specified in the row "3rd / 4th adult" (independently of the cabin category rates, that are paid by the first 2 adults). Children over 2 years-old and up to 11 years-old (on the departure day of the cruise) are charged US$259, when sharing a cabin with 2 paying passengers. Infants under 2 years-old cruise FREE OF CHARGE, except the Port & Service Charges of US$159. For Single Occupancy of cabin categories from IA to XC, please add a 40% supplement on the above special rates. For Single Occupancy of suite categories SJ to SG, please add a 75% supplement on the above special rates. THIS PACKAGE INCLUDES 1 NIGHT HOTEL ACCOMMODATION IN ATHENS: On the right-hand column in the above table, where it is stated "First Class 4-star" it is meant that this Package includes 1 night in a First Class (4-star) hotel in Athens. Where it is stated "DELUXE 5-star", this Package includes 1 night in a Deluxe (5-star) hotel in Athens. All the hotels include Buffet Breakfast and taxes. 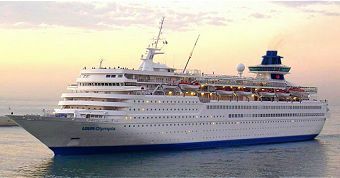 You can have your hotel stay in Athens on any night before or after your 3-day cruise. This is valid for ALL the above seasons. The recommended hotels are the RADISSON BLU PARK Hotel (Deluxe, 5-star hotel) and one of the following First Class, 4-star hotels: AIROTEL ALEXANDROS Hotel or TITANIA Hotel or PRESIDENT Hotel or ATHENAEUM PALACE Hotel or ATHENAEUM GRAND Hotel or BEST WESTERN PLUS EMBASSY Hotel or ILISIA Hotel or ILISOS Hotel. Also, if you wish to extend your hotel stay in Athens for more than the 1 night included in this Package, or to upgrade from First Class to Deluxe, please send us an email.